In a past life, I worked with the National Marine Fisheries Service outside of Washington, D.C. Interested in protecting habitat to improve fishing and other ecosystem services, we set out to conduct the largest ever assessment of US estuaries. Estuaries are the mixing zones where rivers flow into oceans. They are dynamic ecosystems, and support teeming fish and wildlife populations. One of their most important functions is to serve as a nursery for young fish. Hiding in seagrass or mangroves is a lot safer than swimming with tuna for a little fish, and there are plenty of food sources for these fish during the early part of their lives. After they grow up in the ocean, fish like Striped Bass, Atlantic Salmon, King Salmon, Steelhead, and others swim through estuaries on their way to spawn. This makes estuaries a critical transition zone for many commercial and recreational fish species. Estuaries are influenced by the river that drains into them as well as local habitat factors. So, our assessment focused on four major habitat characteristics: excess nutrients (eutrophication), pollution, watershed and local land use, and natural river flows. We used computer mapping software to analyze these variables across the entire continental United States, and summarize them for each estuary. The major benefit of this approach is that we have an apples-to-apples comparison of estuary habitat quality across the country. The assessment includes thousands small decisions that have a cumulative impact on rivers and the estuaries they drain to. If a new subdivision went up in Cape May, NJ, that went into our assessment. If a parking lot was converted to a wetland, our assessment picked it up. Cleanup of pollutants in Missouri? Check. Removal of a dam returning flows to natural patterns? It’s in there. 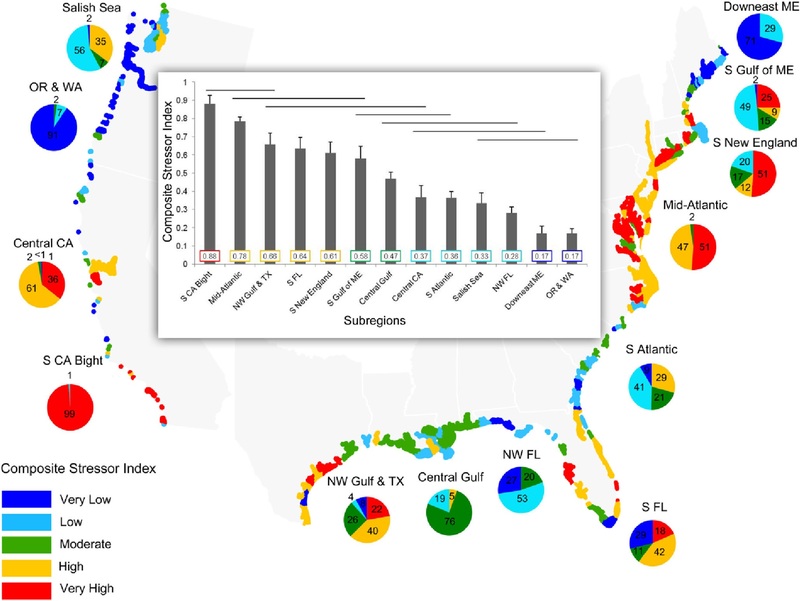 Our composite index of habitat stress shows the distribution of highly stressed estuaries across the United States. The inset shows a regional breakdown of habitat stressors by region, with the Southern California Bight being the most stressed and Oregon/Washington having the best potential habitat quality. So, what did we find? In a nutshell, human population correlates highly with impaired estuaries. Farmland or cities upstream of estuaries correlates well with eutrophication downstream. Eutrophication is an increase in nutrients, leading to excess plant or phytoplankton growth, murky water, and sometimes dissolved oxygen levels that kill or impair fish. We’ve made shoreline modifications that have turned wetlands and forests into sea walls, houses, and pavement near ur cities, meaning that the baby fish mentioned above have fewer places to hide or food sources. The assessment was part of the National Fish Habitat Partnership’s (NFHP) plan to evaluate fish habitat every five years. Researchers working with NFHP from different government agencies and universities evaluated the health of the nation’s rivers, reservoirs, and estuaries. NFHP does a lot of cool work in the Great Lakes area check out the Midwest Glacial Lakes, Driftless Area, or other Fish Habitat partnerships to learn more! Want to know more about our assessment? Read the journal article we just had published HERE. Read the glossy region-by-region breakdown HERE. View a google map of our results or download our data HERE. ← Spencer writes in the library, part 5: Free keyboard, dirty keyboard.